I need a leaflet making that can be used as a promotional flyer for my business when I attend events. 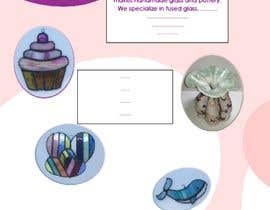 My buisness is in making stained and fused glass and pottery anything from windows, jewellery to vases. The below information is what I need including in my leaflet. The leaflet is to be A5 size, My Logo must be featured on the leaflet. I am happy for the writing to be in black text or a darker colour and a font that is easy to read. Other colours used - I prefer pinks/purples (colours that match my logo). I have attached my logo and some images of my completed glass, there are also plenty of images on my ETSY site. Please make sure when you use images you remove any background e.g. go round the image of my item. Text about what I do/Make - (see below) Please feel free to edit/choose best way of saying below info to make it easy to read, catchy etc. 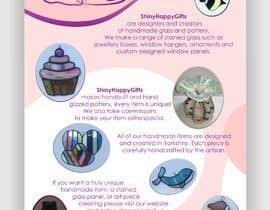 ShinyHappyGifts makes handmade glass and pottery. We specialize in fused glass and dichroic glass. ShinyHappyGifts makes items from stained glass such as jewellery boxes, window hangers and ornaments to custom designed panels. We make handbuilt and hand glazed pottery, each item is unique and can produce a commission for you that is 100% unique. Our handmade items are all designed and created in Yorkshire, items such as glass are sourced locally where possible. 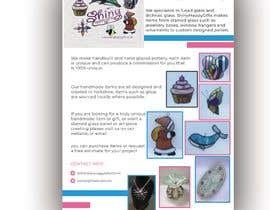 If you are looking for a truly unique handmade item or gift, or want a stained glass panel or art piece creating please visit us on our website, or email where you can purchase items or request a free estimate for your project.